JC: The article below is a guest post from one of our readers. Katie’s experiences of being involved with an alcoholic are classic. Her future husband has many of the personality traits of an alcoholic, lying, arguing, blaming others, thinks he can stop drinking on his own, and more…Please feel free to comment below her story offering wisdom and comfort to help her get through yet another day of dealing with an alcoholic. My future husband is an alcoholic. Looking back on the 5 years we’ve been together the red flags were all there in the beginning. However, I told myself that we were both young and without any children so occasionally drinking to excess was normal. I know now that he was a functioning alcoholic. I ignored how quickly he’d go through his bottles of cheap bottom shelf vodka. I told myself that he has always treated me well, his work life didn’t suffer and what a hypocrite I’d be for bringing it up since I was a social drinker. Then his functionality started to morph into dysfunction. He had a couple of dui’s and lost his license. Then he lost his job. It was then that reality started to hit me. This was not normal. He was waking up before me in the morning and drinking without me knowing. Or maybe I didn’t want to know? Regardless he found a job, a better job even and things seemed to be improving. He stopped drinking vodka and moved on to a couple high gravity beers after work. He was doing good at his new job. I told myself it was a step in the right direction. He proposed, I said yes. For about a year things were ok. But then one day out of the blue I got a call from his HR manager, they were taking him to be tested and more than likely I’d have to come pick him up, that he was losing his job. Again. My world started to crumble around me, my heart was broken. Turns out he was hiding his early morning drinking from me, again. Driving to the gas station at the end of the road and buying a couple at 6 am when they opened. Going to work drunk. He blew a .32 at the clinic and he was seemingly sober. He should have been unconscious. Check out what Al-anon has to offer by clicking here. So here we are. Present day. I’m struggling, I don’t know what to do. I love him, I want to support him and his road to recovery unconditionally. I do not want to watch him kill himself. He’s never been abusive or nasty to me and we don’t argue much unless it’s about his drinking. Actually some days I believe my decision to leave or stay would be easier if he were abusive. I have told him that I will no longer pretend I’m okay with his drinking habits. He tells me I’m trying to control him. I tell him I’m sorry he feels that way and I love him. When I ask if he thinks he has a problem he’ll tell me yes but refuses outside help. He insists that he can do it on his own. Just one beer he says. Only it’s not just one beer, it’s a 24 oz can of malt liquor in the morning and then just “one” more after that. I’d like to give him an ultimatum but I don’t think I’m ready to follow through if nothing changes. I’m also scared to death to move forward into marriage and a future family with this disease. To Tina : we are not mean people. It is very simply that our hearts have been broken so many times and we are telling our life stories for people to learn from and maybe gain the strength to live from day to day-that’s all. Denise forgive me if you think I am saying you are mean people. I just said we need to stop saying all the mean stuff about these people. 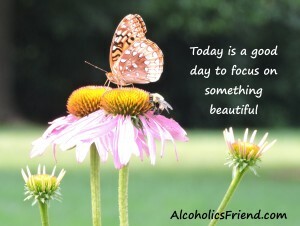 And that is your opinion but Alcoholism is a disease as well as other addictions. It is a gene and if the gene is turned on and someone has it then it is very hard to turn it off. Some of these people do want to get better just like one alcoholic said when it comes knocking you need to call your sponsor. I will never rip on a person with the disease. Like I said you never know when it could happen to you or your child. And when it is your child it is heart breaking. I would just comment, that its very different being a parent of an alcoholic or addict than being a romantic partner of one. As a romantic partner, spouse, bf or gf, of one we have a choice to walk away, I’ve met parents who do too with the right support, put in hard boundaries is the only thing that might make them better. For my alc/addict gf, i tried the whole prayer thing and all that, but really my life continued to detirorate, so the solution for me was GET DISTANCE…..I dont have to have daily contact with her to wish her well, and I find having no contact at all, is much better for me, and for the alc/addict, I’m no longer contributing as an enabler. I came to believe that any form of contact, is enabling. Tina….I know this is a disease. I know these people are sick. I have done my homework on addiction. My husband is a recovering alcoholic….he stopped drinking at 60 because he would have died otherwise. I have an alcoholic daughter. Life has not been easy BUT if you are in a position to leave the A, then I say RUN for your life and don’t look back. Life can’t be any worse without the A. I agree to pray for them but I don’t believe we have to give up our lives for them either. through a very difficult journey that they are forced to face, then it is more than worth while to let anyone vent until he becomes well enough to rationalize their feelings and situation. 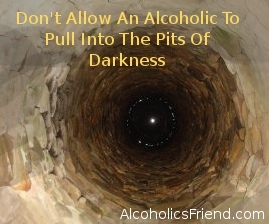 Some of us have ruined our lives by living in the alcoholic environment far to long. I know your intentions were meant well Tina. The world sees the alcoholic as the victim and the families are at fault. Here we learn differently to protect our selves if the alcoholic refuses to change. Please continue to contribute as all of us need to be reminded of our own situation that might be different from their own. Zits, has your rah changed his personality. Does he still blame, criticise or has he learned to communicate and be accountable for his feelings and actions. My father was a dry drunk and I became the scapegoat (problem) in the family 5 years after he quit drinking. Has caused me a life time of problems and then I marry a high functioning alcoholic. than a spouse or father. You have a spouse that supports you…we have had spouses that year us down. that people have children that are a. We are not mean, we have been abused. With respect to you. I would disagree with K that it makes everybody in the family “as sick as the alcholic”, for that to happen, that would mean, I would be acting un-reliable, un-responsible, abusive and destructive to everybody that loves me and is nice to me, for my behavior to be as sick as the alcoholic. I would hurt people, break the law, do what I want without any repercussions, if I was as sick as the alcoholic. If i was as sick as the alcoholic, I would not have sleepless nights worried about the alcoholic, i would just get wasted and cheat and find another partner, then lie about the next day like active alcoholics and addicts do. I’ve heard this sort of thing before in some alanon meetings, people beating themself up, trying to identify that they are as “sick as the alcoholic”, i find even considering my behavior resembling an active alcoholic in any form, is just absurd. For me the key identifying behavior of active alcoholism, is the utter complete lack of responsibility towards loved ones, and the total disregard for how my bad behavior might affect loved ones and thats the exact opposite of me. so on that point i completely disagree on any comparison of non-alcoholic/addict friends and family to an active alcholoic or addict. Hey All, to AM>>them, not her. Because what would happen when I’d try to block her number or cut comm with her, she’d call them asking where I am, and then they’d bother me and get in the middle. So I cut them off first, then slowly set boundaries with her. So #2, later last year, a white male mid-50’s, I heard on local news got arrested for criminal mischief, multiple counts, he was basically doing vandalism. This was 4 months after i cut contact with him. Now that i had the clarity and the education, I thought to myself, wow, #2, yep, he’s messed up, he’s probably drinking and doing crack. I was happy I blocked him. Shortly after, he seemed to call me from some alternate numbers, I guess he got out of jail, and wanted to chit chat with me. I blew him off. His messages got nastier and nastier, I blocked his alternate numbers. Now I dont know how, maybe my mobile carrier website lost my blocks but today I got some texts from him, pictures of him with his girlfriend, writing me that “im a psycho”..
Oh really? Im a pyscho? I havent said, done, or communicated to him since May 2014, and I’m a pyscho? My point is, I as a non alcoholic, non-addict have done nothing wrong to provoke this abuse. I dont call people pyscho, just because they dont wanna talk to me. Its just another version in a platonic friend, where the alcoholic addict is abusive. I just dont need these people in my life. Im glad i got rid of them all, really, nothing but drama and noise, and stress. Hi mmmmmm……this website and people sharing has been a lifeline! In retrospect, everything falls into place. I pray daily for him. Truly. All I can do. I did not contact kids and say a word. I can only imagine the lies he told about me. They get it. They know. Problem was I was last to know. This has been a journey. In retrospect, when you look back and see that all these people no longer speak to him or he doesn’t speak to them – wow you wonder why! Always something that other people have done. He is never to blame. He lies continually . as my sister says, his mistress is the bottle. I am learning to have respect for myself! Thanks to everyone for sharing. It has been a lifeline! God bless! First of all people no one told anyone on here not to think of themself. Im just saying these are very sick individuals. Pray for them and pray for a cure some day. MY goodness. Zita this is for you? What do you do about your daughter? I could use a some insight. use those barriers every day in a positive way is my challenge and my journey. I wish you well. Tina….I don’t do anything about my daughter’s drinking any longer. There is no point. Over the years, I have tried everything….from encouraging, threatening, listening and on and on. Before Al Anon, I would be heartbroken when she would be drinking and blaming me for everything….I shed so many tears. I knew in my heart that I had been a good mother, but her words would cut deep. I hadn’t realized that alcoholics lied and blamed everyone around them. Now, her words have no effect on me. We basically haven’t a relationship. She had left her husband and son, had affairs, and is now back with her husband. Her 9 year old son called 911 months ago when his parents were fighting and she was taken away in handcuffs. Her husband continues to enable her so why should she stop drinking. Years ago when I tried to tell my husband there was a problem with her drinking, he would get angry and tell me “that’s your answer to everything”. Well he now realizes that it was not all in my head….I think it forced him to look at his own drinking problem and he hated that. So I just continue to pray that she will see the light. I didn’t think there was hope for my husband but it has been 1 1/2 years now for his sobriety. He attends AA meetings every day except Saturday. He has tried to encourage our daughter to do the same but she does not want to stop drinking. It is sad…it is what it is. I have finally accepted the fact that I can no longer help her and that I have had to distance myself from the craziness and drama that is her life. Not sure what it’s going to take for her to stop the destruction of her soul and body. I have been thinking of everyone that has responded and I am so grateful to have a place to vent and learn. I am reading a amazing book call Loving someone in recovery. Even thought my AH is still drinking I wanted to find out what it has to say. Have only read the first few chapters and must say it is teaching me things about myself that I was not aware of. One of the things it says is that people that drink have not learned how to have close relationships due to not having them as children. I can certainly say that is true for me and from what I know true for my husband. There is alot of things in this book that makes me uncomfortable to admit but I feel like it will help me to realize the part I have played in where I find myself at this point in my life. One thing that I can say is that the alcoholics I have know are very self involved and seem to live in the past a good part of the time. Along with being hard on the people in their lives they are equally as hard on themselves. I know my AH is a wonderful man when he is not drinking and I have to remind myself of this when he is in his binge phase. I think whoever said that they do remember is correct. I say this because through the years my AH has learned to control his remarks better because of my learning to not react and to leave with love when he starts his bad mouthing. It is the hardest thing I have ever learned. Thank you to al-anon for all the help. I am still a work in progress but this journey has taught me some amazing lessons that I would not have learned had I not been married to an alcoholic. hi just to respond to K, and I dont mean sound like im judging you or anybody by any stretch, all I say here is what I’ve learned and believe about dealing with alcoholics and addicts, im a man who had a alc/addict female partner. The point of my earlier note addressing what you wrote was I didnt have much luck in ALANON, its a great program, but where I live its better for women than for men. The men in my local alanon are all alacoholics who come from AA to alanon meetings for various reasons of their own. The problem for me is , they like any alcoholic addict, starting judging me, telling me what to do, and taking all the emphasis of my alc gf, and blaming me, which when I finally got a GOOD therapist who’s been practicing 41 yrs with alcs, addicts and family and friends of, he corrected me on all this. What was happenning in the meetings was they were trying to control and manipulate me UP TO telling me, that “alanon is the same disease without the alcoholic”. NO ITS NOT. It absolutely is not the same disease. Actually alanon’s qualifying criteria says it right “we were affected by the disease of alcoholism”….THATS fine, I agree, ok, cool, good but thse guys, and alot of idiots i came across were trying to tell me I had the same disease as them. No i dont, I do not, never did and likely never will. I’m too responsbile, Im sensitive to others, even though I hardly drink, its not a disease of quantity, its a disease of attitude. My gf, was not a fall down drunk, but she was an irresponsible, destructive person to everybody who cared about her, including me, including her kid, including everybody in her life, totally self centered and all about self. I have a therapist 3 to 5 times a week, HE doesnt tell me what to do. For anybody who’s presently suffering the blame game victimization from an alcoholic close to you, I pose the question, Do you deserve this abuse? Who is “responsible” for the destruction of the relationship? I can say, almost 1 yr into my freedom, she my alc/gf was %100 percent responsibile for the destruction of our relationship via her behaviors and abuse of me, lying cheating, etc……%100 her fault. Biggest problem for me was “my inability to dis-engage”…..its normal to be upset, to be anxious, to curse, to fight back, problem for me was dis-engaging. As i got stronger I started to tell some of these idiots i met in meetings who would say “be kind to them they have a disease”, i would say ” if someone hits me with a baseball bat i have a right to hit back”. Now I say, tell that to the families who’s loved one got killed by a DWI driver,,,,,,,enough of the BS,,,,,,,,,,its their disease NOT mine, i wish them well, but stay out of my life. Thats a fact. P.s for the past 18 months of so of my new therapist, I MYSELF have had to DETOX from the poisonour comments I got in Alanon, all which were scientificially wrong about the issue of co-dependents of alcoholics and about the disease of alcoholism. I do belive the books in Alanon are “tainted”, to be nice to alcoholics, maybe because it was Started by Bill W’s wife. When and if i raretly attend a meeting now, I publicly challenge the illogical comments in the daily readers. HOWEVER its great for women, I’ve witnessed it, they support each other %200 and have all these behind the scenes support by phone (get out from your husband, you dont have to take that, etc…I HAD NONE OF THAT)….I actually started having nightmares about these men in the meetings. Call me a wimp fine, but I was PTSD’d out from the GF relationship and vulnerable, so like any predator, they took advantage of my weakness and put all this nonsense non-correct data about the disease in my head. Deal with it, by not dealing with it. Walk away . tough LOVE. And tough love is harder on those who are used to giving themselves and love to others.! My friend’s b’day is this Friday 9/25. I send a b’day card to everyone. Guess what? I am not sending a card. Want to but won’t. I have to respect myself. My mom used to say that sometimes people have to hit rock bottom . I am not going to be manipulated, lied to, used , blamed for things I didn’t do to go to rock bottom with someone. I pray for the person….. still trying to tell myself that things happen as they should. Guilty of caring, loving, and enabling someone. Does it hurt? You bet.But not going to beg someone to answer the phone or my email anymore…… that’s a 17yr olds game. world. You made my day, maybe I am not crazy after all. Well ya know, my therapist who i just saw and see probably 3 to 5 times a week, would say, “what was this alcoholic doing in an alanon meeting”. my therapist treats alcs and addicts for 41 years, and Im convinced he’s right. Instead of saying what he would say, I’ll say it in the first person. Yes its charming and maybe interesting to hear them with their BS infiltrating and Alanon meeting, but in my opiinoon what ARE THEY DOING in MY MEETING??? What they’re doing IS NOT TREATING ALCOHOLISM, which is a COMPLETELY %200 DIFFERENT AILMENT. They were not “affected by the disease of alcoholism or someone elses drink” they are the disease, living and breathing and its JUST THE WRONG ROOM!! One pleasent surprise for me, NA Narcotics anonymous……addicts don’t go to NARANON . Im surprised. I dont know why, surely addicts had parents who were addicts and wanna blame them for their miserable life, but I have not seen addicts in NARANON. I think its because the parents and family and friends in Naranon, have stronger boundaries and won’t buy the BS if an NA/addict came in to preach. I have seen this in CODA and after a while I got disgusted, same problem, AA’s coming in dominating and whining that they drank because they’re co-dependent, it just defies all the recovery science on the planet and all the pricipals of their primary program AA. Its like letting a wolf loose on a pen of chickens, an Alcoholic walking into a CODA or ALANON meeting. Its not their diagnosis, and its not treating their disease. yea people say “take what ya can and leave the rest”, well I can’t very well do that if Im downtrodden and being manipulated daily by an alc/addict, I go to a recovery meeting, I assume people have decent intentions, unfortunately they’re no police and its fair game so I choose to stay away and not be further abused in meetings. SLAA same thing, I thought I liked the concept of love addiction, until one guy said “your problem is your addicted to addicts”….when I told my therapist that he said “that is absolutely ridiculous, if you were addicted to addicts every single person in your life would be an addict you wouldn’t have all these non-addict people in your daily life in work, and friends and so forth”. plenty of people out there just waiting to diagnose me, my therapist says nobody on the planet can-out wit, outsmart and alcoholic or addict especially in a romantic relationship. everybody gets duped, and ends up in the same boat, feeling like we’re left in the trash bin. perfectly normal, and very very hard to get out of. he feels alcoholics are more complicated to deal with than narcissists, pyschopaths, borderlines or anything, BUT IT IS TREATABLE with AA…NOT WITH THERAPY. He will not see alcoholic patients if they are not going to AA daily, BECAUSE they will out-trick him, and out-fox him, he learned along time ago. He only sees alc/addict patients who are going to AA or NA, and he sees absolutely no need for them to ever set foot in Alanon or CODA. energy will be in reach of numerous people over the next several years. Lastly, anybody must be capable of maintain energy for use at the later time. on the sea with efficient enough technology.